Here at Jolee Tablecloths we don't just sell oilcloth, PVC vinyl and table protectors; we also stock a growing range of fabrics. We have lots of customers wanting to match their oilcloth tablecloth with their cushion covers or roman blinds, which is why we are expanding our ranges of matching curtain fabric. As creative people ourselves we understand the needs of customers when searching for cotton fabrics. 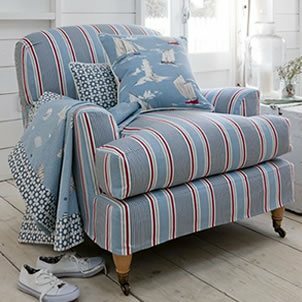 Whether you want to make a set of curtains, a cushion cover, quilting, crafting or looking to reupholster your much loved chair, this is the site for you. Tartan fabric and plaid fabric has seen a massive rise in popularity over the last few years. Why not try our stylish and extremely popular Skye Hunter Tartan Curtain and Upholstery Fabric? Or perhaps our Harris Dove Grey Curtain and Upholstery Fabric which is perfect for use as curtain fabric, cushion covers and as a quilting fabric. With a rub test of 70,000 you can be assured of its quality and suitability for domestic and contract furnishing use. We stock a wide range of Polka Dot Oilcloth Fabrics and we know at times how important it is to find a matching polka dot cotton fabric. That’s why we have over twenty different colourways in polka dot cotton fabric; taupe, grey, duck egg, blue, sage green plus many more. If polka dots aren't for you, our growing range of Scandinavian inspired cotton fabrics is perfect for you. Whether you buy fabric by the yard or fabric by the metre we will have the size for you. If you can't see the size or design for you then please contact us, as in most cases we can also order designs in for you. We know it can sometimes be quite frustrating when searching for cotton fabrics online that everything looks the same. We thought the same as well, which is why we have developed our own range of oilcloth and cotton fabrics. All our cotton fabrics are 100% cotton and digitally printed so you can be certain of the print quality. With designs such as our extremely popular Duck Egg Seagulls Cotton Fabric or just as popular is our Grey Seagulls Curtain Fabric you can be certain that you won't have seen this fabric design anywhere else in the world. Make sure you stand out from the crowd with our exclusive Jolee Cotton Fabrics.